Make the stock up to a day ahead: put the giblets in a pan, add 1ltr (1¾pt) water and bring to a boil, skimming off any scum. Add the rest of the ingredients, cover and simmer for about 1 hour. Strain the liquid, cool, cover and keep in the fridge. 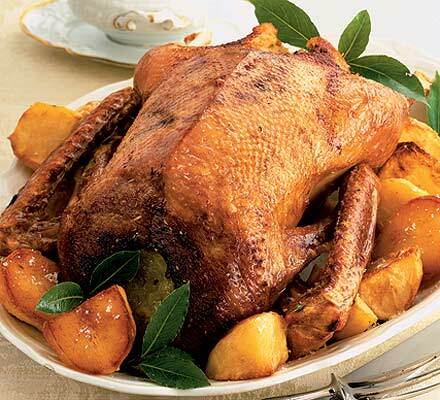 To roast the goose, preheat the oven to 220°C/fan 200°C/gas 7. Remove any feather stubs with tweezers and place the peelings, lemon rind and sage in the cavity. Season inside and out, and place breast-side down, on a rack in a large tin and roast about 30 minutes until brown. Turn breast-side up, and cook a further 20 minutes until the skin is brown. Pour the fat in the tin into a bowl and save for roasting potatoes. Reduce the oven to 180°C/fan 160°C/gas 4, and roast for a further 1½-2 hours or until cooked – the juices should run clear. Lift the bird onto a board, cover with foil and leave to rest for about 20 minutes. Make the gravy by pouring off all but 2 tbsp of fat from the tin. Put the tin on a medium heat and whisk in the flour. Cook for 1 minute, stirring to scrape sediment from the tin, then pour in the stock, whisking. Bring to the boil then simmer for 2-3 minutes. Season, strain, and serve with the goose and apple sauce.